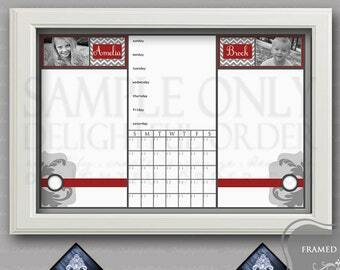 Looking to keep your child's schedule organized? This is the perfect piece for you. Your child will love being able to see what's ahead, creating a more organized life for them, not to mention how much it'll help mom and dad out, all while bringing Delightful Decor to your home. This listing is for a high resolution 16"x20" JPEG Digital File, which is available as an instant download. Simply print your JPEG file, attach your child's photo to the print, Place the print into your favorite 16x20 picture frame and write directly on the glass with a dry erase marker. 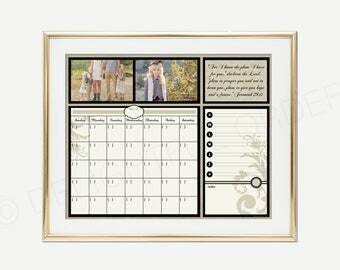 Use over and over as a dry erase board, tracking your child's weekly and monthly schedule. If you'd like, hot-glue a clip directly onto the glass of your picture frame to hold all of your child's important papers, homework, etc. 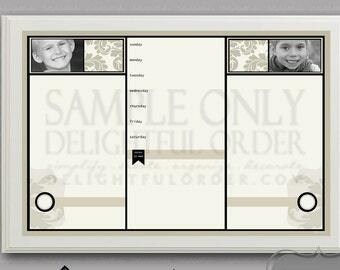 All Delightful Order Digitals are for personal, non-commercial use only. Copyright: Delightful Order - Original Work and Protected. I LOVE these pieces! She wrote exactly what I wanted and they are beautiful! I cannot wait to hang them beside each of my children's pictures!